Intel is launching four Kaby Refresh CPUs today under the 8th Generation banner. SemiAccurate thinks doubling the core counts is a good thing but the rest is, well, a mild refresh. 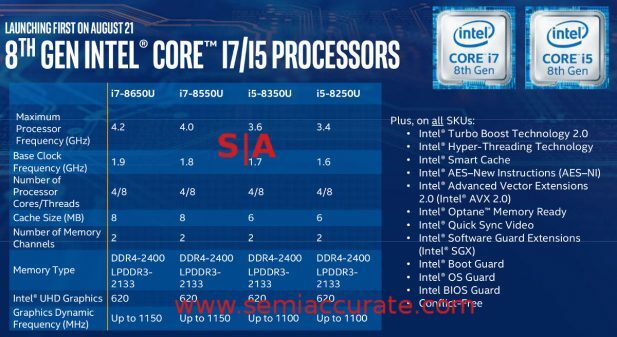 There are four new SKUs that comprise the 8th Generation Intel Core CPUs which will eventually encompass three distinctly different processor families. Those would be these Kaby Refresh parts, the upcoming Coffee Lake 14nm processors, and the late, lamented 10nm Cannon Lake line. Based on what SemiAccurate learned today though, don’t expect this last one to ship in anything more than PR quantities. Intel seems to be learning some marketing tricks from GPU makers and that is not a good thing. So what are the four CPUs launching today? The most impressive stat in the new CPUs is the core count, up two to four on all of the models. The most comparable non-refreshed Kaby Lake CPUs are found by subtracting 990 from the model number, i7-7660U for example. This is the basis for Intel’s claim of a 40% productivity increase with the very important caveat of doing so in the same power envelope. We were a bit skeptical of this claim a few days ago but the caveat makes us less so. That said the die size bloat is going to hit Intel’s margins just like we said. Intel is claiming these CPUs get ~25% of their gains from “architecture” aka +2C, ~10% from manufacturing, and ~5% from design although we can’t shed much light on this last one. In any case Intel is effectively downclocking the cores and adding more, the oldest trick in the GPU book and it works here too with a few more caveats, all good for Intel. Those would be that the base clocks drop radically, exactly 600MHz for each of the four new models from their closest 7th Gen counterparts. This is expected of course, it is the point of the new chips. Also as you would expect the top turbo clocks for 1C turbo goes up 200MHz versus comparable -990 models, something likely attributable to process advances. Better yet 2C turbo matches 1C turbo clock, something we haven’t seen from Intel in a long time, and on the i5s the 4C turbo is the same as well. For some reason the i7-8650U has a top 4C turbo of 3.9GHz and the 8550U tops out at 3.7GHz for 4C, not bad for 15W TDP CPUs. On the graphics front all four are GT2 models meaning 1 shader cluster with nothing disabled. GPU clocks also rise a bit, not the 300MHz base clock for all models but the top turbo, 1150MHz for i7s and 1100MHz for i5s. This represents a 100-150MHz bump over the 7th Gen part, and again it is likely attributable to process tech more than anything else. No word if they fixed the crippling 3D rendering flaws yet but if we ever get our hands on one, we will give it a test. All of these GPUs are still Gen9 so they are probably quite comparable to Kaby and Sandy in every way. Intel has a host of new ‘technologies’ meant to secure content from users but it allows 4K streaming content from a few services. Since this is Windows only we don’t think it is relevant to much and will likely be forgotten like the last 12 or so versions of their proprietary media technologies. Similarly they have a security ‘technology’ called Online Connect. Like their prior efforts it requires Windows so they are mandating an insecurable OS in order to add some security for users. Just say no.